Single Wall Gas and Oil Flexible Liner. Single wall flexible chimney liner for use on gas and oil applications. 1 year manufacturer's warranty for all products installed and maintained in accordance with the installation and usage notes. 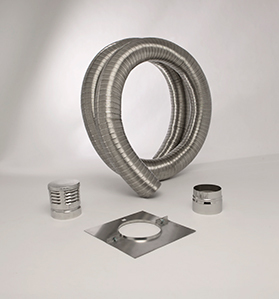 Gas flex is a single wall stainless steel flexible flue liner designed for atmospheric gas and kerosene appliances where the flue gas temperature does not exceed 260 deg C.
Available in 100mm (4 inch) up to 150mm (6 inch) diameters in various cut lengths or packs, which include a clamping plate and a gas cowl or oil (standard) cowl. All flue system installations, i.e. oil, gas, solid and multi fuel, should be carried out by a suitably qualified installer or Building Control Department permission must be granted.